Tonight we went out to look at lights. Unfortunately the Squaw Creek show must not be happening this year, but we did find several homes who appear to have enough Christmas cheer for the lot of us. It's tricky business trying to get a clear picture at night. I was beginning to think that it was the end of the POTD, but I'm so close to the finish now... I have to complete the task. So, it may not win any awards, but satisfies the requirement. The quote has very little to do with the photo of the day, but was a very profound statement made by Little Man as we were driving around tonight. He and Pokey were fighting (surprise, surprise) and Little Man was getting frustrated with how Pokey kept talking about the past and how mean he was to her, etc. This statement was the result. Not sure I totally agree, but pretty deep for a 10 year old boy. Cedar Rapids is no longer the city of 5 smells. It has now taken on an entirely new one. The old Sinclair Packing plant has been smoldering (I think unintentionally?) for the last couple days and there has been this horrible ash tray sort of smell everywhere. It's bad and has officially made it the city of 6 smells, at least in my book. Nasty. Is that what that smell is? I keep thinking it smells like cigarette smoke, so gross. Love the picture though. Yeah, you're almost done! Isn't that house neat? We went and saw it a couple weeks ago. 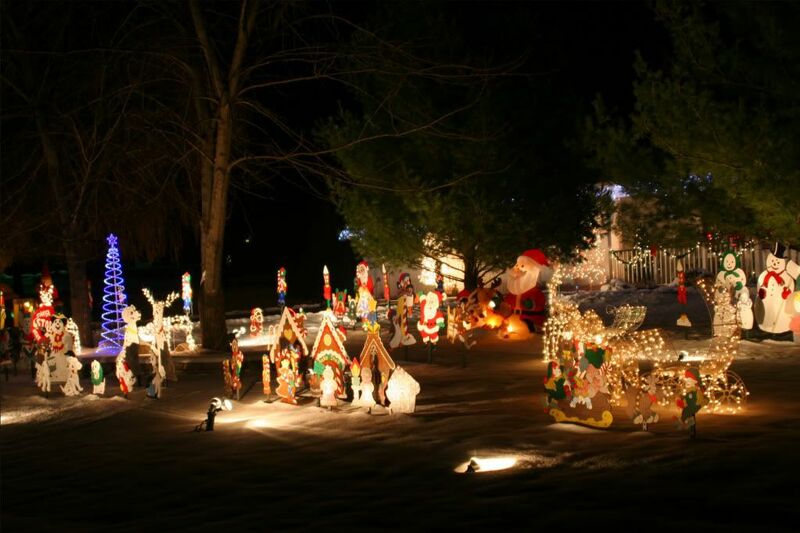 There is a great family story behind the way they decorate every year. It's really sweet. That is a great quote from Connnor, great words for us all to live by. I am so surprised by his thought!! I'd have been floored if it came out of either of my kiddos mouths! haha but maybe its' because I'd have never come up with that! that's a funny quote by conner....very insightful!! haven't smelled this smell you are all smelling....ok, that's alot of "smell" words in one sentence! glad i haven't....sounds gross! Oh, I've smelled the smell. Not good! Where is that house? We haven't gone to look at lights yet so some tips where to go is appreciated. very wise. Olympia does a "tour of lights" and although we already did fantasy lights, I'm excited to drive around real neighborhoods and see what people have done.